Addition of strength and conditioning coach could result in more wins. It’s been impossible for Alabama A&M to simulate what they will see versus the University of Alabama at Birmingham on Saturday. UAB is returning to football for the first time this year after a three year hiatus, so who knows what they’ll do. In the meantime, Head Coach James Spady has concentrated on A&M sharpening their fundamentals and looking for improvement on the things that they do well. The thing that seemingly has him the most excited is the work that the players have put in with their strength and conditioning coaches. “This is the first summer that I’ve had a strength and conditioning coach,” Spady said this week. The addition of Lonnie Brown has added more to the team than just biceps and quads. “They did a really fantastic job of the attitude aspect, getting those guys in shape. We lost three football games last year, we were either in the lead or tied at the half. Towards the end of the 3rd quarter in most of those. That is a direct reflection of depth and the ability to finish football games,” said Spady. 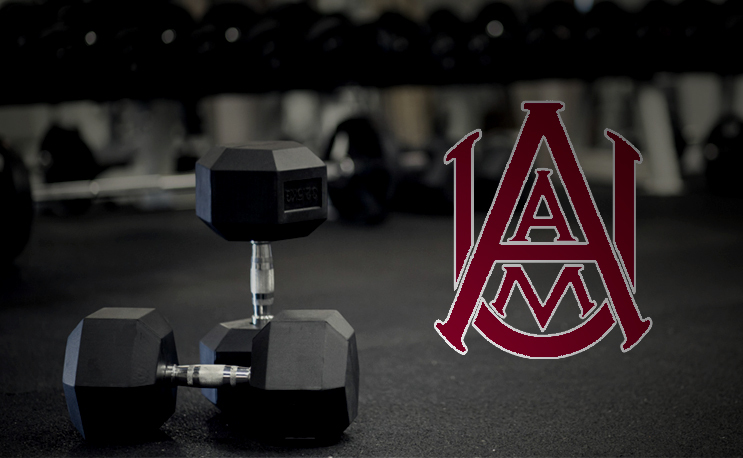 Spady is entering his fourth season at AAMU and will start the season with his most experienced team yet. He has 15 returning starters including All-SWAC sophomore running back Jordan Bentley. As a freshman last season Bentley averaged over 77 yards per game, fourth in the conference. With offensive lineman a tick stronger and in better shape during the fourth quarter, leads that were lost could flip into Bentley running down the clock to more victories. The Bulldogs haven’t had a winning season since 2012, if they turn the corner this season look for Spady to continue singing the praises of his strength and conditioning staff.